While customers might think occasionally to tell you when you are doing something well they will generally not give you any sort of customer feedback except for the occasional thanks or unprompted referral. This is not helping your business to grow. In order to really understand how your customers are feeling and how you can improve you need to actively seek out their input in a format as clear and easy for them as possible. Just asking will be an excellent first step. It’s a well-worn joke but it’s true. People don’t want to hurt your feelings and unless you are careful in how you approach the customer feedback task you’re unlikely to get the truth from your customers. Asking customers face to face what they think of your business will probably get more white lies and half truths than accurate responses. Alternatively it will just reinforce the top layer ideas or easy to hide behind responses. In fact if you want to obtain an excellent (and misleading) customer feedback score just ask your customers what they think of your business in your next meeting. A few will give you some high level, small, issues but most will say everything is just great, even when it isn’t. It’s true that you will have a few customers who tell you the unvarnished truth but I’d be surprised if it was more than a handful. What are the rest thinking? To overcome this issue you need to have a well-constructed customer feedback approach that allows you to collect accurate information from your customers and understand their real thoughts. If on the other hand you want to obtain a more accurate and effective understanding of what your customers think, use an internet survey and if possible make it anonymous. The cloak of anonymity will allow customers to tell you what they really think of your business: what is working well and what is broken without worrying about hurting anyone’s feelings. Don’t underestimate the impact of not wanting to provide negative feedback about your business. For a certain proportion of your customers, larger than you think, they would rather just stop buying from you than face the confrontation of telling you what you are doing wrong. This is the worst case scenario. You lose a customer and you don’t even know why. When you call to find out why they stopped buying they tell you price. When a customer says price is the issue it almost never is. Price is just an easy to use excuse. This is even more important in a high value relationship. Consider the situation where you are an important supplier to their business. One they really can’t afford to go without for even a short period. Because the implications of disruption to their business is higher than normal they may well engage another supplier and be in a position of not needing your products or services before providing the ultimate feedback – no more sales. 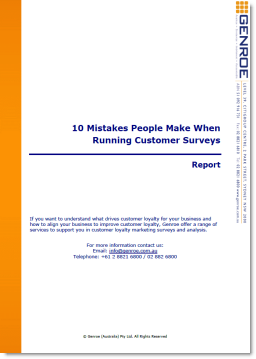 Even if you think you know exactly what your customers are thinking, is it worth the risk of being wrong for the sake of a simple easy to implement customer feedback survey?. Fine, try this test. Get yourself a good quality customer feedback survey and answer it as you think your customers will respond. Then send it to your customers and see what they say. The differences between the two responses can make for a very interesting reading.